An abandoned rock walled Hawaiian language school site just mauka of the coast in Nīnole in Kā‘u, Hawai‘i Island is where speaker Kalei Laimana’s ancestors studied prior to the school being closed down and students moved to an English standard school about 10 miles away in Pāhala. The removal of the native Hawaiian language in such schools helped inspire Kalei in his study of the remarkable rise in literacy in Hawai‘i that began with the arrival of the Sandwich Islands Mission in late March-early April 1820. 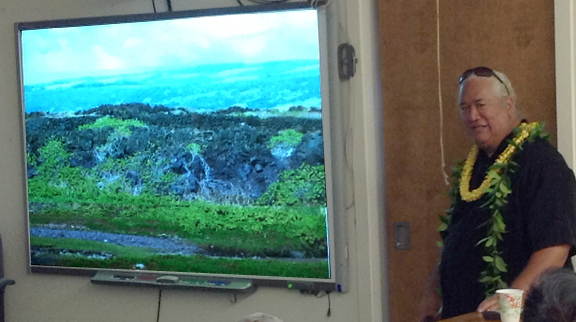 John Kalei Laimana, Hawaiian Studies Instructor at Leeward Community College, told of his remarkable findings on the rapid spread of literacy in Hawai‘i from 1820 into 1832 at a talk held at Kaua‘i Community College’s Hawaiian Studies classroom on Tuesday, April 11, 2017. 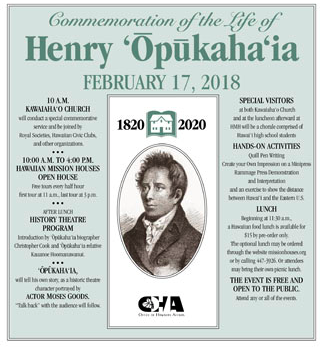 The talk was sponsored by the Office of Hawaiian Affairs, the Kaua‘i Historical Society and Kaua‘i Community College. Kalei in 2011 submitted his “The Phenomenal Rise to Literacy in Hawai‘i – Hawaiian Society in the Early Nineteenth Century” as his thesis for his Master of Arts degree at the University of Hawai‘i at Mānoa. Kalei went beyond the historic statistics to primary sources, most notably the journals and letters of American Board of Commissioners for Foreign Mission missionaries stationed in Hawai‘i. He combed for years such materials in the Hawaiian Mission Children’s Society library located in Honolulu near Kawaiaha‘o Church. 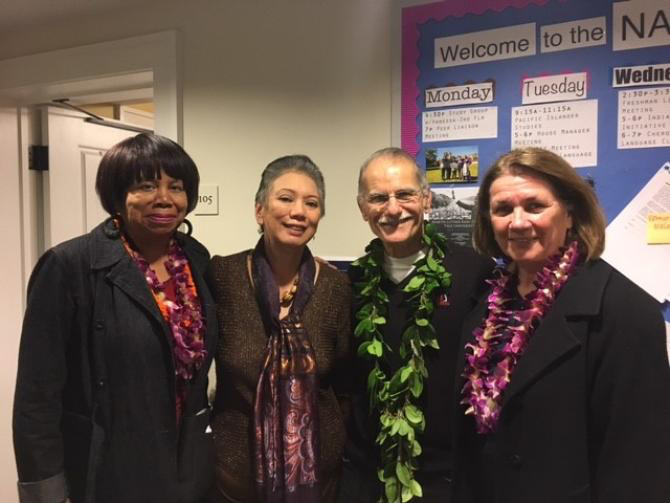 The speaker said he found the lives of Calvinist-leaning Sandwich Islands Mission leader Hiram Bingham and his wife Sybil Bingham to grow in aloha towards Hawaiians over their 21 years stationed in Honolulu. He said New England editors of Hiram Bingham’s classic Sandwich Islands Mission account A Residence of Twenty-One Years in the Sandwich Island chose to focus on the stern and controlling character of Hiram, overshadowing the genuine love of Hiram for Hawaiians. Sybil Bingham, an experienced New England-upstate New York school teacher, used her teaching talent in Honolulu at the outset of the mission’s education work just weeks following her arrival in spring 1820 in Honolulu. An extract from “Mrs. Bingham’s Journal” published in the American Board’s Missionary Herald monthly revival-missions periodical shows she and John Honoli‘i employed the Memoirs of Obookiah in spreading literacy in Hawaii. July 31, 1820 – In the afternoon about 20 (scholars) were collected, when I read to them in the memoir of Obookiah, having it interpreted by J. Honoree and Sally J. I endeavored also to convey to their dark minds a few simple truths, which the Bible contains. Two hours passed in a most interesting manner. It seemed like being on missionary grounds. There was fixed attention on the part of most. I thought of a remark in a letter from our friend S. Taylor, soon after the death of Obookiah, to this effect, after speaking of the darkness of the providence, which snatched him away :– “but how much good may be done by his memoirs, should they be written, in the hands of missionaries among his countrymen.” Little did I then think that I should be the first to read a page of these memoirs to them. But so, in the mysterious providence of God, it was ordered.